We slept like a pile of rocks after our first day at the parks, but I still woke up extra early to get ready to go to Disneyland. 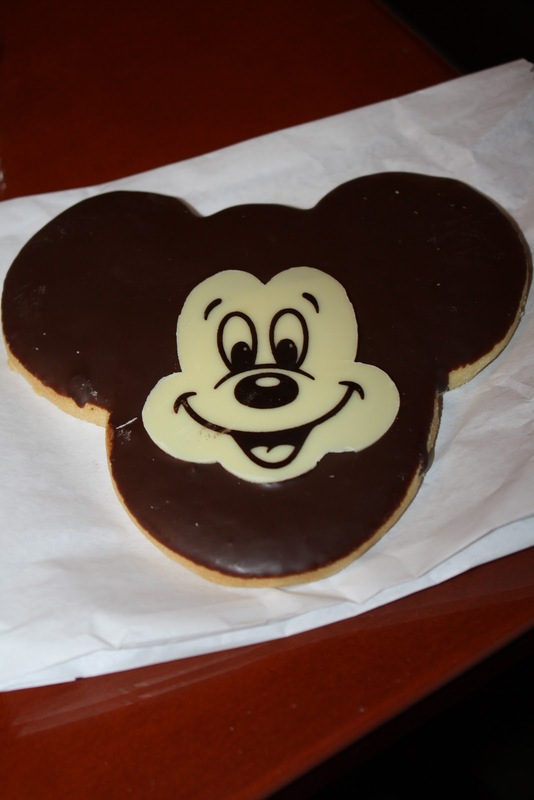 This cookie was calling my name! I am such a sucker for a sugar cookie! I heart them! It was a no brainer this cookie was coming with me! I was hoping today would be better with meeting characters. I had a hunch what might work and I took a gamble. I bought Hailey one of those autograph books and told her that we were going to see how Pluto and Mickey and all their friends write their names and then if they do a good job we'll take a picture with them to show her friends at school. I don't know if she was having a better day or she just bought what I had said but that stinking book WORKED!!! The first characters we see are Mary Poppins and Bert. What kid under 10 knows Mary Poppins anymore? Hailey didn't, so I was sure she was going to freak, but she handed over her autograph book and they signed it, then Hailey SMILED for a picture. Yes, smiled! I couldn't believe it! She loved that book and we took it everywhere we went. Our first stop was breakfast. Something that wasn't 90% sugar. I had gotten a phone call from my little sister saying that she and her daughter had drove the night before and were going to meet us in Disneyland. They were going to spend the WHOLE day with us! Hailey didn't know, but she was going to find out right now. Got to sign that book first! Now we are full of smiles! We are getting the hang of this now! Next up was Vidia! Loved her purple hair and her attitude. It's all about Vidia and I loved how she was in character and talking about how great she is! LOL! Our first ride all together was the Finding Nemo Submarine ride. This ride was pretty cool! It isn't very disabled child friendly though. Josh had to carry Hailey on his shoulder while going down a wet spiral staircase. I held my breath the whole time! This is Darla or Dah-la from Finding Nemo. It's the only good picture I got in the submarine. It was pretty compact in there. Not for anyone who is claustrophobic. Josh got this picture of the monorail in front of the Matterhorn. Did you know the Matterhorn has a half court basketball court built in for the mountain climbers that are taking a break! Fun Fact! I have lots of those! Both my niece and Josh enjoyed a whirl on King Arthurs Carousel. Walt Disney's wife has her favorite horse on that carousel and that horse has a golden tooth! My little girl was having such a great time and she sure did deserve every single minute of it! We had yet another little surprise that turned into a very huge surprise for all of us later this day. That's coming up next! !